Perge is located 8 mi. [13 km.] north of the Mediterranean coast of Turkey — about 10.6 mi. [17 km.] northeast of Antalya. It is situated on the large fertile plain of Pamphylia just west of the Cestrus river (modern Aksu river). In New Testament times ships were able to sail up the Cestrus to a point near Perge. On Paul's first missionary journey, Paul, Barnabas, and John Mark sailed 175 mi. [280 km.] from Paphos on Cyprus to Perge. Here John Mark left the "team" while Paul and Barnabas walked 155 miles [246 km.] 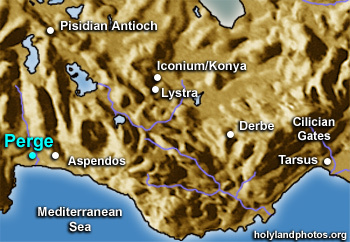 inland though the Taurus mountains to Pisidian Antioch (Acts 13:13–14). After having completed their work in Pisidian Antioch, Iconium, Lystra, and Derbe, Paul and Barnabas returned to Perge, where they preached (14:25), before departing from nearby Attalia (Antalya) for Antioch on the Orontes. Perge was a very prosperous Greco–Roman city with a theater, a stadium, magnificent gates, a 980 ft. [300 m.] long main street that had a 6 ft. wide water canal flowing through it, a forum, a nymphaeum, baths, etc. It has been extensively excavated by Turkish archaeologists and many of its beautiful statues, sarcophagi, and small finds are well displayed in the museum in nearby Antalya.